JERUSALEM — Thousands of Ethiopian-Israelis are protesting in Tel Aviv against alleged police brutality after an officer killed an Ethiopian man two weeks ago. 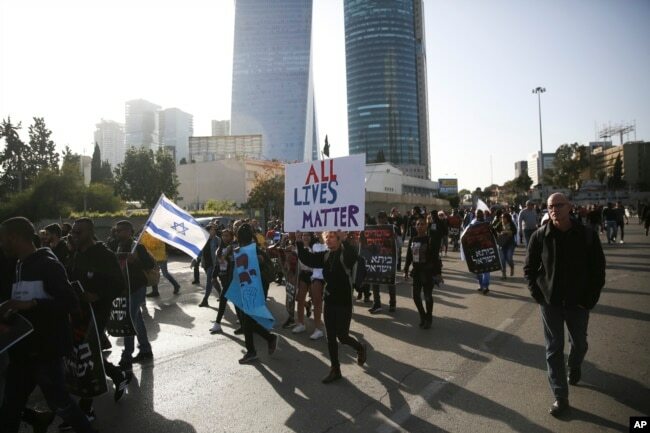 Demonstrators blocked a major highway in Tel Aviv on Wednesday and paraded through major avenues of the city protesting what they consider to be systemic police mistreatment of the minority group. They carried signs saying “police are killing Beita Yisrael,” a Hebrew term for the Ethiopian Jewish community. People march as they protest against Israeli police and demand the appointment of an investigating judge to probe the killing of Yehuda Biadga, a mentally ill Ethiopian-Israeli, by Israeli police, in Tel Aviv, Israel, Wednesday, Jan. 30, 2019. Earlier this month, a policeman shot dead 24-year-old Yehuda Biadga, a mentally distressed man wielding a knife, in the Tel Aviv suburb of Bat Yam. Israel’s Justice Ministry is investigating the incident. Biadga’s family accused police of excessive force, and protest organizers called the incident “the straw that broke the camel’s back” after years of perceived discrimination by Israeli authorities.